I had just returned to New York City from delivering the 2018 Trout Lectures at Trinity Lutheran Seminary in Columbus, Ohio, when I received word that my beloved professor, now colleague and friend, Dr. James Hal Cone had died. In 2012, Dr. Cone had been invited to lecture at Trinity Lutheran but had to cancel his appearance because of an onslaught of death threats in response to his newest publication at the time, The Cross and the Lynching Tree. 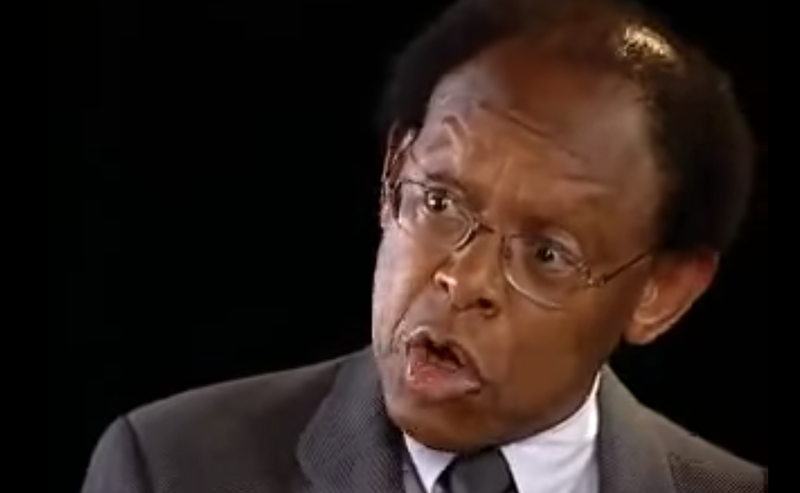 Amid the outpouring of “thoughts and prayers” the world over and a host of remembrances held in his honor at divinity schools and theological seminaries across the nation, the truth is that James H. Cone was, in fact, the most hated theologian in America at one time. The first African American to earn a Ph.D. in systematic theology from Northwestern University in 1963, Cone often recalled how some of his graduate professors refused to shake his hand at his commencement, given their racist disbelief in the successful completion of his degree. Following graduation, it would not take long for Cone to reposition his expertise in the theology of Karl Barth to the God talk of his mother, Mrs. Lucy Cone, a pillar, he would say, of the Macedonia African Methodist Episcopal Church in Bearden, Ark., spurring him to interrogate the question at the heart of black life in the U.S.: What does God have to say about “why whites treat blacks so terrible”? Although his specific place in the genealogy of black liberation theology is debatable, Cone is unquestionably its 20th-century systematizer and, as such, is noted as the father of liberation theology. Beginning with his first now-classic monograph, Black Theology & Black Power, immediately followed by three more—A Black Theology of Liberation, The Spirituals and the Blues, and God of the Oppressed—Cone carefully began the work of dismantling a dominant white theology, but further identifying the white church as the Antichrist insofar as it undergirded and perpetuated black suffering as the white supremacist will of God or, worse yet, remained silent in the face of black dehumanization. Emerging at the radical interstices of Martin Luther King Jr.’s black Christian faith that demanded justice, and Malcolm X’s resounding call for black power, Cone’s black theology of liberation fearlessly asserted racism as heresy and proclaimed a God of the oppressed who stood against racism in all its forms. And the white church and its theologians hated him for it. They hated him for clearly and uncompromisingly identifying the paradox of white theologians who “scarcely uttered a word about white inhumanity toward blacks” as the arbiters of “the nature of the gospel and of the discipline responsible” for explaining it. They hated him for deploying their beloved German theologians to indict white American theology for its moral failure. In the wake of Cone’s death, those who never thought to call his name or add his texts to their syllabi are now fondly referring to him as “Jim,” feigning personal intimacy and intellectual respect. Institutions that would never have invited him to speak are sending forth their “thoughts and prayers” in ways that lend more to colonizing his legacy than carrying it forth. To be sure, men have long been sanitized posthumously to assuage and erase the guilt of those left behind. Of course, Martin Luther King Jr., who was the most hated man in America at the time of his assassination in front of Room 306 on the balcony of the Lorraine Motel in Memphis, Tenn., is a prime example of U.S. amnesia rooted in the sterilization of the legacies of black freedom fighters. The truth is that Cone was far from perfect. Some of his closest friends and colleagues, like Gayraud S. Wilmore, Vincent Harding, Charles S. Long and even his dear brother, Cecil Cone, made sure to remind him of this regularly. Black womanist theologians and ethicists like Katie G. Cannon, Jacquelyn Grant, Delores S. Williams, Kelly Brown Douglas, as well as Townes, would emerge in the mid-1980s and early 1990s, respectively, to assert even more blind spots within black liberation theology, especially in relation to the invisibility of black women and, later, black sexuality. In his For My People: Black Theology and the Black Church and later editions of his earliest works, Cone would be led to reflect in a sustained way on the weaknesses of his system, especially its development as an overreaction to white racism, as well as its lack of social, economic and gender analysis. Nevertheless, his fiery rhetoric and scathing critique of church, academy and society was a wake-up call to the entire Christian community. While some continue to disingenuously characterize his critique as angry, hostile and excessively harsh, what must never be forgotten is the depth of his love for black people. Nevertheless, his fiery rhetoric and scathing critique of church, academy and society was a wake-up call to the entire Christian community. Cone’s profound love and abiding joy for black life surfaced every time he stood in front of a classroom or put pen to paper or heard the spirituals and the blues. His love surfaced in his passion for black art and black dance, and his celebration of black excellence lived out loud in the face of white supremacy and its goons. The most hated theologian in America built an entire disciplinary field. He authored more than 12 books and over 150 articles. He trained, chided and developed more generations of black theologians and black pastors than any other systematic theologian in the contemporary world. He taught us that God is black and that black is beautiful, baby. He did all of this because he loved us so. He taught us that God is black and that black is beautiful, baby. I must have called James Hal Cone’s name over 100 times in the lecture hall at Trinity Lutheran Seminary, where, just a few years prior, death threats had urged his retreat. As I sat in the airport that Friday afternoon on my way back to New York City, just hours before he would take his last breath, I penned a letter to him as an “end time” reminder of an enduring black and deeply Christian hope, that the most hated shall also be our most loved. Eboni Marshall Turman, Ph.D., is assistant professor of theology and African-American religion at Yale Divinity School. She is a Public Voices fellow with the OpEd Project. You can follow her on Twitter.